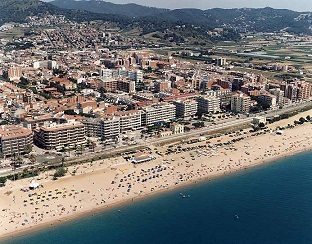 Pineda de Mar is a seaside town in the comarca of the Maresme in Catalonia, Spain. It is located on the coast between Calella and Santa Susanna and is a very popular summer holiday destination. The city centre has several historical sites and buildings from the 17th and 18th centuries. Some arches of a Roman aqueduct still survive over the Pineda river.